High-quality backlinks are good for an obvious reason. They are… well, they’re high-quality. That means they are intrinsically beneficial for domain authority and SEO rankings. I am already working with 40+ SEO companies for link-building of their client websites. You don’t need to worry about backlinks because Our team provides risk-free and google panda safe backlinks. These backlinks are reliable, trustworthy, and foolproof. And that’s important for your link-building strategy. 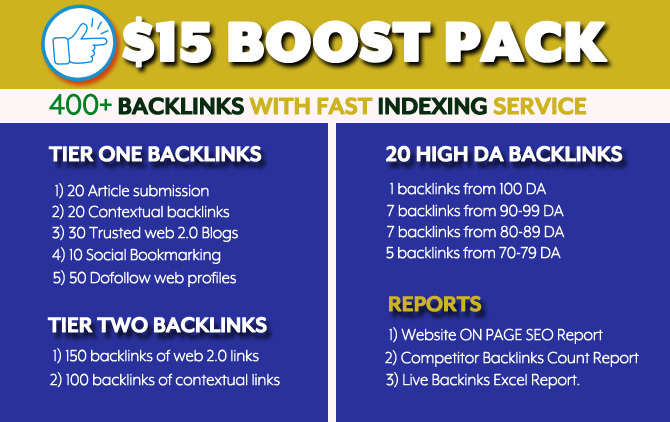 Try once, this 400+ backlink boost pack. Here, This is all in one SEO boost pack for your link-building strategy. All backlinks will be created manually, no software has been used! They are a hummingbird, penguin, and panda safe. 100% genuine and spam free work. Will boost your rankings in search engine. Don't hesitate to ask many of your queries. I'd love to work for you.